Thanks to the White & Case/Carolyn B. Lamm Scholarship, Slovakian student Iveta Stefankova has been able to pursue her International Arbitration LL.M. degree at Miami Law. Dennis Scholl, J.D. `81, was recently named as the president and chief executive of ArtCenter/South Florida, the nonprofit supporting artists and advancing the knowledge and practice of contemporary visual arts in South Florida. A cold war has raged in the brain of James Valencia since high school. 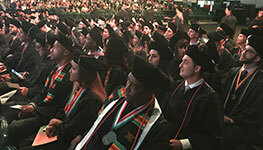 Moot court success is synonymous with the University of Miami School of Law. Miami Law is a gateway, and a launchpad. It attracts students from around the world and propels them on new trajectories. Amilcar Martinez and 3L Andrew Sarangoulis come from different worlds. Martinez grew up in Honduras; Sarangoulis in Reading, Pennsylvania. The two crossed paths through the Health Rights Clinic at Miami Law.